Our management -- up on the 56th Floor, or so they claim, although we personally have never visited -- our management has ruthlessly, ruthlessly slashed our compensation package, now insisting on paying us for the heating-and-cooling component of our labor based on differential savings per therm. We aren't even sure what that means, but it sounds draconian. Whenever we think about it, we must stand over the spirit duplicator, whose fumes, we once discovered, give us mild relief from anguish. When we complained, they threatened to cut the power to the AC unit entirely and buy a LEED-certified hand crank for the air conditioner pump which they claim they saw at the Center for Green Technology near Garfield Park. We simply don't have the back muscles to hand-crank an air-conditioner compressor for a skyscraper. In this -- hmph! climate -- of fear, we have been forced to sunlight™. (We often tend to work nights, which explains why we coined this new expression.) One of our sunlighting™ sidelines is locating lost people. We appear to be more competent at this than at deep-frying falafel. Please don't tell GB management that we are sunlighting™. Shaulis was a child prodigy pianist from New Jersey who suddenly and mysteriously disappeared from view in the 1980s. She has some terrific Bach recordings from the '70s, plus a recording of a Samuel Barber piece that I love. I'd love to track her down and write a story about her career and herself. I came up with one address for her -- at [address deleted] Road, Ringwood, NJ. I mailed a letter to Ringwood and it came back -- "no forwarding address." There's one clue I haven't followed up -- [since] the 1970s, I know she is/was married to the poet William Kollock. What intrigues me is the near-total lack of information about her on the Internet -- surprising for one of the top Bach interpreters in Europe (where she lived a while) for a good decade. As I say, I'd be willing to pay for your time if you can dig anything up [like] an address and/or phone number. Let me know! Back in Ann Arbor in 1985 or so, at the Liberty Music Shop, I had bought an LP of Zola Shaulis' terrific version of Samuel Barber's "Excursions," and have always wondered what became of this one-time child prodigy and award-winning concert pianist. Internet and database searches revealed absolutely nothing past the late '70s, which piqued my curiosity further. How -- and why -- does a well-known musician disappear so abruptly and completely? Through Peter's assistance, I got in touch with Zola, who now lives most of the year in St. Petersburg, Florida, and we had a wide-ranging conversation, augmented with e-mails. A kind and modest person, perhaps a bit too balanced as a person and real as an artist to be comfortable in a celebrity-oriented musical culture, Zola retired from the concert scene 30 years ago to raise her daughter. In conversation, some of the old emotional scars of prodigyhood and a rigorous touring schedule became visible. But she still plays, teaches and thinks about music, and perhaps she may surprise us again with her musical intelligence and elegant technique. I want to be there when she does. Thank you, Peter. And, thanks for the plug, Mr. Iglarsh. We will cheerfully accept unmarked twenties. Did we happen to set a price? 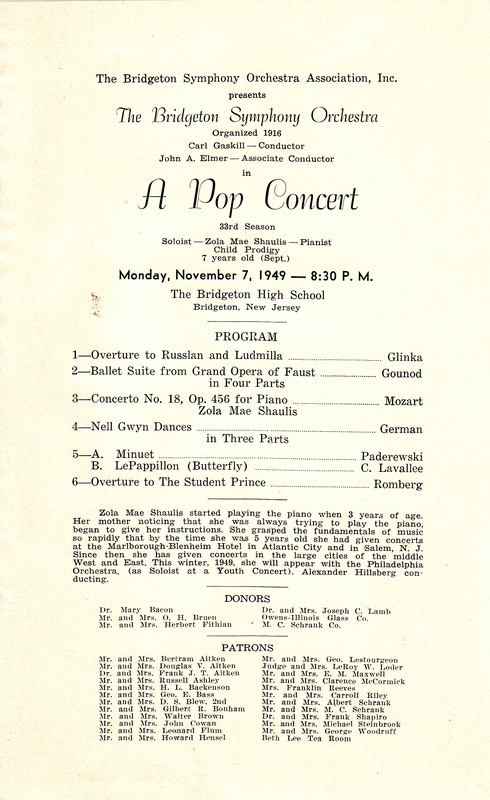 Update, February 12, 2010: Jack Moore of Philadelphia sends us the scan below (click to zoom in) of a musical program, with this note: "I read with interest your Gapers Block on Zola Mae Shaulis. I was recently going through some papers in a music library, and came across the attached. 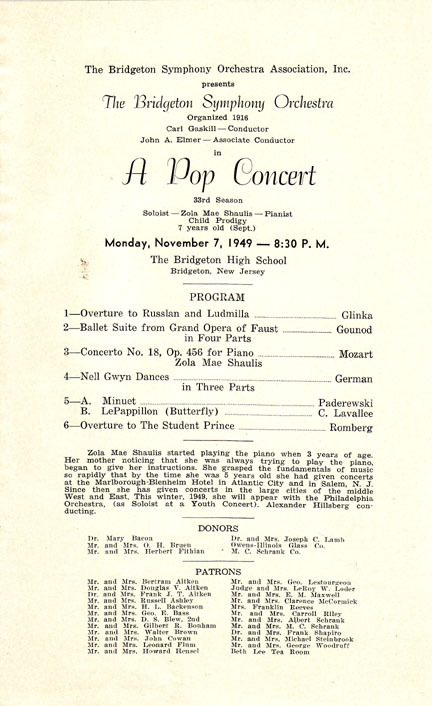 It's a concert program from a small orchestra in Bridgeton, N.J. (the next town over in New Jersey from where Zola Mae was reared). She appeared there just prior to playing in the Philadelphia Orchestra concert you mention in your article. I don't know if you, or she, would be interested in seeing it. I can't say I'd heard her name before (I grew up in Bridgeton and became a musician, though the Bridgeton Symphony was long out of business by the time I came along)."